Product prices and availability are accurate as of 2019-04-13 09:26:52 EDT and are subject to change. Any price and availability information displayed on http://www.amazon.com/ at the time of purchase will apply to the purchase of this product. Mount-It! 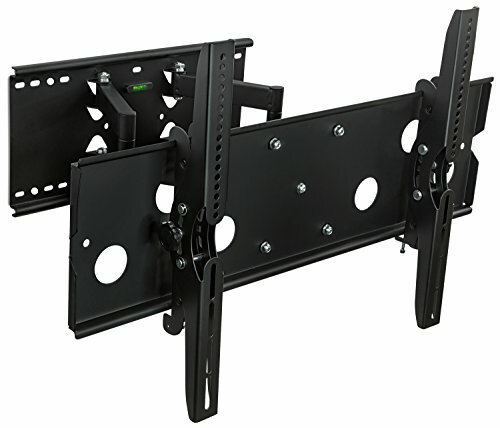 heavy-duty full motion articulating TV wall mount offers extreme versatility with a maximum extension of 20.25" from the wall. Its dual arm design is incredibly sturdy. This mount is a beast that will safely carry your TV. Dual TV safety screws are included to prevent accidental liftoff of the display. The use of heavy gauge metal minimizes sagging even fully extended. 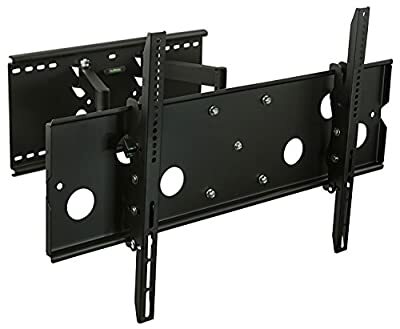 Compare pricing and weight capacity to any other articulating TV wall mount on Amazon. MI-310B swivels from left to right for viewing from multiple angles. Ideal for corner installations. Powder coated steel construction provides a sleek, high-tech look. - TV Size Range: 32" - 60" (some even up to 75" depending on VESA bolting pattern and the TV weight) - Max TV weight: 175 lbs - Mounting Pattern: Universal and up to VESA 750x450 and 175lbs (Fits VESA 750x450, 750x400, 700x400, 600x450, 600x400, 600x300, 600x200, 400X400, 400X300, 400X200, 300X300, 300X200, 200X200, 200X100, 200X150, 100X100 mm). - Mounting Holes: up to 30.3" apart horizontally and up to 18" vertically - Wall plate dimensions: 19.75" wide by 9.5” wide. This wall mounting kit is compatible with Samsung, Sony, LG, Sharp, Insignia, Vizio, Haier, Toshiba, Sharp, Element, TCL, Westinghouse 32, 40, 42, 48, 49, 50, 51, 52, 55, 60, 65, 70 inch TVs. Tilt, Swivel, Articulate, Extend, Collapse with this universal TV wall mounting bracket. Full motion capability makes is ideal for corner installation, over a fireplace, inside a TV center. This wall mount is designed for 16" studs. TV stays as close as 4.5" from the wall or can extend up to 20.25 inches. Swivel left or right 45 degrees. 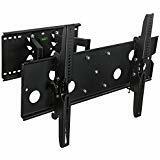 Universal TV wall mounting bracket design fits most of 32-60" LCD/LED/Plasma TVs on the market (even up to some 75 inch TVs) up to VESA 750x450 and 175lbs (Fits VESA 750x450, 750x400, 700x400, 600x450, 600x400, 600x300, 600x200, 400X400, 400X300, 400X200, 300X300, 300X200, 200X200, 200X100, 200X150, 100X100 mm). 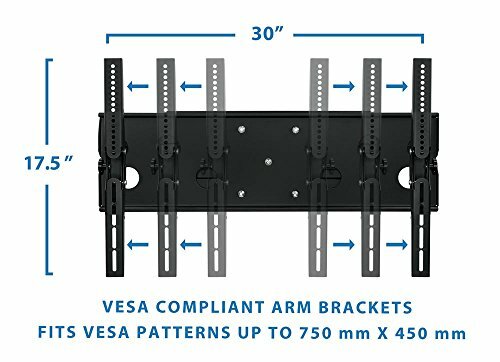 Please check VESA (mounting hole pattern behind TV), stud spacing, possible blocked cable/input and TV weight prior to making purchase decision to determine whether this TV wall mount fits your TV and the installation application. Continuous Tilt Feature (up to 15 degrees up or down) for Better Viewing Angle and Reduced Glare. Low-profile design ensures TV is close to the wall for a sleek finish. Large open wall plate design assures easy access to back of the TV and cables. Weight rated to 175 lbs - This bracket is one of the strongest brackets available on Amazon. Install your precious TV with confidence. Dual arm design prevents sagging that might be visible on lower weight rated and single arm mounts. Constructed from Reinforced Steel. 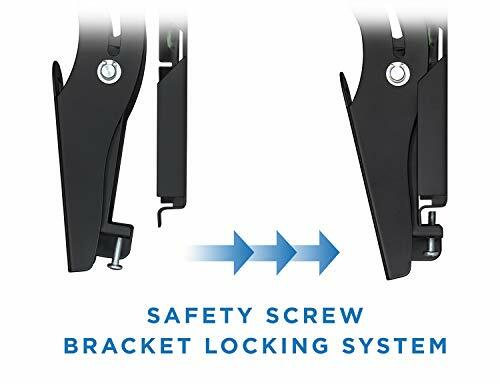 Quick and easy to install - bracket comes complete with full instructions, integrated bubble level and FREE INSTALLATION HARDWARE.